Happiness is an inside job but the outside world can sometimes limit your options. We opened our first shop in 2009 right after the beginning of the banking crisis with the view that people will need to reduce there spending on essential household furnishings and there was a gap in the market for a real second hand furniture shop. While lots of second hand shops where closing down because they refused to lower the price to meet the economic climate we opened up because we decided to operate on a different business model to them. Our philosophy is very simple, we sell at low prices, make people happy, keep the stock moving, which keeps the shop interesting and people go away happy and keep coming back. They tell all their friends what a great deal they got at Deccie’s, which keeps the shop full with new customers who have a need, but have limited options and access to cash due to the credit crunch. 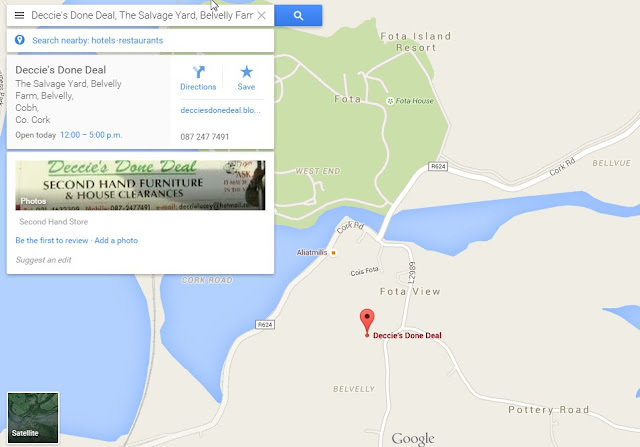 The first shop was very small but it was in a great location and helped us get established within the Midleton area. After 3 years in business it was time to move on as the roof of the shop was damaged by high winds and half our stock was now sitting in two inches of water every time it rained. Disaster!!! Not in our way of thinking, just time for a change, in every disaster there is an opportunity to grow and grow we did. Instead of looking for another small shop in a good location we decided to move to the biggest location we could find within walking distance of the town. With the intention of providing even better service to even more people, with the same business model. To put it simply, if your iceberg is melting move to a different iceberg!!!! after another 4 year in this location a fire in the building next door forced us to move once more. We are now located in Cobh which is a much more central location for all the surrounding towns. We went from having a 2000 square foot shop to having a 5400 square foot shop which again proves that with the correct attitude a disaster can be turned into a positive.